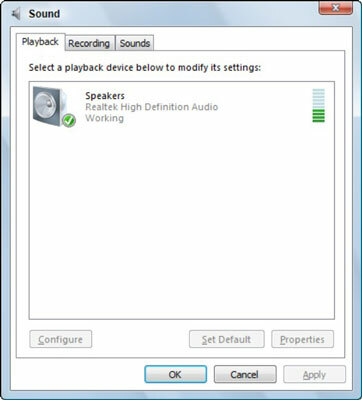 Setting up external speakers in Windows Vista is pretty simple. Thanks to today’s plug-and-play technology, speakers require very little fine-tuning to get them up and running. That being said, Windows Vista gives you the tools you need to balance the speakers and adjust the sound levels when you get started. 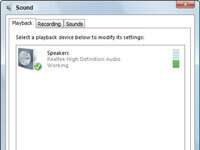 1Attach speakers to your CPU, laptop, or monitor. On most new computers, the plug-in location is often labeled with a little megaphone or speaker symbol. 2Choose Start→Control Panel→Hardware and Sound; then click the Manage Audio Devices link. You can locate the Manage Audio Devices link under the Sound heading. 3In the resulting dialog box, double-click the Speakers item. 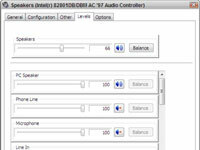 The Speakers dialog box contains the tools to customize your speaker and set performance parameters. 4Click the Levels tab, and then use the Speakers slider to adjust the speaker volume. If there is a small red x on the speaker button, click it to activate the speakers. 5Click the Balance button and adjust the sound balance. 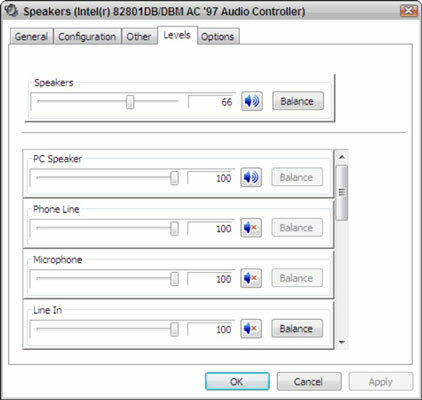 Use the L(eft) and R(ight) sliders in the resulting Balance dialog box to adjust the balance of sounds between the two speakers. 6Click OK three times to close all the open dialog boxes and save the new settings. Now pop in a CD and rock ‘n’ roll!